Description: This listing is for ONE set of grips. Buy any 3 non gun non ammo items, and shipping is Free for the entire order, lower 48. Here are Hogue’s plain and simple replacement panels to fit any recent production Beretta 92 and 96 series fullsize pistols, including models 92SB, 92F, 92FS, 96F, 96FS, 92D, 96D, and M Nine.Manufacturer and warrantor is Hogue, Inc., of Henderson, NV. Construction is hard polymer inner frame with pliable rubber exterior. They are attractive enough, they don’t really add any width to a Model 92F type pistol, and their soft rubber construction makes the Beretta handle better and gives more grip security during protracted shooting sessions and in foul, wet weather. We use a good many of these ourselves, so we try to keep them on hand all of the time. 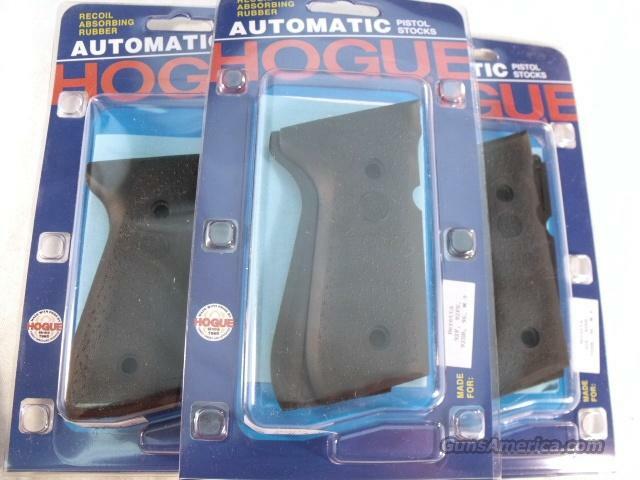 We’re offering these excellent, economical, and ergonomic Hogue Grips, factory number 92010, each set	for only	$14.00.